New financing to scale production of its multi-robot system for warehouse fulfillment. Robots used in a variety of tasks during the installation of a new lighting system at the Toyota Stadium in Aichi, Japan. Companies need to consider hidden costs before looking at offshore options for manufacturing. Why checking equipment and calibration in real time keeps product quality high. Rensselaer lab working to expand robot capabilities to improve humans’ quality of life. Analyzing risk through algorithms to keep construction sites accident-free. MIT CSAIL's 'RoCycle' system uses in-hand sensors to detect if an object is paper, plastic or metal. Company also announces new AI software to improve navigation for mobile robot fleet. 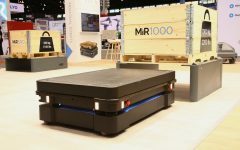 Cobot tools aimed at manufacturers looking to automate packaging, palletizing, and sanding processes. Conveyor integration and a new mobile robot named Bolt helps to expand company's mobile manipulation system for fulfillment operations.